Congratulations to Sally Ann Chambers for winning the Grass Roots Coach Award at the West Midlands Goalden Globe Awards on 30th June 2017. Congratulations also go to Midrange Netball Club who won the Outstanding Netball Club award at the same event. Both Sally and Midrange will now go on to represent the West Midlands at the National Awards – Good Luck from us all at Dudley Netball! Sally Ann Chambers – Congratulations! A BIG congratulations from all at Dudley Netball League to Sally-Ann Chambers, who was recently awarded Coach of the Year at the 2016 Black Country Sport and Physical Activity Awards and was shortlisted for the West Midlands Coach of the Year in November 2016. As well as being our Chair, Sally is a member of Midrange Netball Club in Dudley. She coaches the junior section including U14, U12 and U8 girls. She is an excellent role model and inspiration, working hard at all that she takes on and inspiring people to both play and coach the sport that we love. Where do you start with background information on our guest this evening? Chris Groves has been actively involved with netball for what must seem like all of her life, in various roles. Isle of Wight Tournament winners, and the Gateshead tournament winners, to name a few. As the club expanded, she took on the role as Treasurer. Chris also played for South Staffordshire County, and after retiring from playing she took on the role of coach, coaching different age groups within the County structure, and was honoured to be asked to coach the 1st senior team. She did this with great success. In recent years she was presented with her England long service award for over 25 years’ service to South Staffordshire County. In her profession she worked in the statistics office of CEGB Tipton until they closed down and then she moved to Metsec as Payroll Manager, where she is still working. This experience led her to being invited to join the Dudley netball committee as Treasurer. In 1983, Chris took on the role as Chairman, the committee knew then, that she was the right person to steer the league forward, and that they would be in safe hands. Speaking with the committee members from that time, they have all stated that Chris was extremely focussed in her duties as Chair person, and she excelled in the promotion of the league. One recollection was her involvement in organising a demonstration game against the England Netball team of the time, in 1985. A lot of hard work and dedication went into arranging player accommodation, the attendance of local dignitaries, and the general organisation of such a prestigious event. 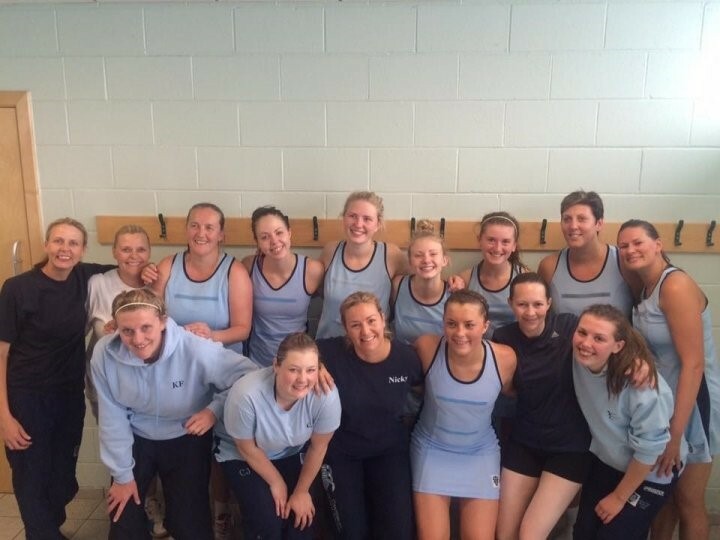 When Chris took on coaching Dudley Leisure Netball Club, it was a great success. Over the years the club have had up to 6 teams participating, including their junior development squads, and have had the honour of having young internationals coming through – Laura Malcolm, Caroline Tarnowski and Rebecca Tildesley, to name a few. Dudley Leisure is not only renowned within this league, but also within the regional and premier leagues. Chris has provided inspiration and innovation to the club for over 30 years, and has dedicated her time to ensuring that the club has remained at the forefront of netball within this area. Now that she has retired, she will be missed, and was greatly missed over the summer. It was strange to not have her pop into the hut and have a chat between rounds, or be there to offer words of wisdom to us during the season. She may come across as being ‘a bit scary’, but she has a heart of gold, a wicked sense of humour and is definitely one of the kindest people I know. Her dedication, commitment and love of the game are insurmountable. We must mention Phil, Chris’s husband, who has supported her through her netball career. They are now enjoying grandparenthood, and spending time with Freddie their grandson. So, Happy retirement Chris; wishing you good health from the committee and all of the Dudley League members. 3rd Prize – New match ball. Winning number 873 – 932212 on blue ticket – Mike from Libra Lea. (claimed). Money raised will go to research on Alzheimer’s disease. Many, many thanks to everyone who supported this very worthwhile cause. Libra Lea unbeaten through qualifying and final play offs to secure their place in West Midlands Senior Regional League division 2 for next season. After what seemed like a very long 3 month campaign, our regional squad girls qualified for the final play offs by winning all 5 of their qualifying league group matches. A tough and nervy day then lay ahead on Sunday 28.06.15, playing 2 full matches against tough opposition. In a very tense first game, and going into the final quarter just one goal up, the Libra girls finally came out on top against Elmdon 42-31, having been behind for most of the first half. A second game to follow, against Bran Nu, was never going to be easy and the game remained tight all the way through. With the scores at 34-28 going into quarter 4, the game was still on a knife edge, but once again the girls dug deep and with some fantastic accurate shooting from Lucy Percival and Emily Priest, were finally able to pull away to secure a 50-37 victory and clinch their place in the regional league for the first time and at the first attempt. A very special day for all the players, club members and supporters of Libra Lea NC. A wonderful achievement for a club that was only formed in the autumn of 2010, with just a single team of youngsters and a couple of more experienced oldies playing in the Walsall Midweek League. On behalf of everyone at Libra Lea, we would like to thank everyone for their kind messages of congratulations and good wishes.